It was 1976 — a time when bell-bottoms were more common than barbells – and the 29-year-old coach ushered in a new era of Mohawk football by renovating the high school's training facilities. "He and the assistant coaches went in there with a sledge hammer," recalls Scott RARIDON, a former offensive lineman. "They say in '77 he had the nicest weight room in the state . . . and it was built by hand." A state championship followed in '78, establishing the blueprint for achievement that ALVAREZ would use while transforming Wisconsin into a Big Ten Conference powerhouse of the 1990's. He now becomes the 203rd inductee to the Des Moines Sunday Register's Iowa Sports Hall of Fame. "I think his players just thought the world of him," former Iowa coach Hayden FRY said. "And, of course, when they really like a coach, they’re going to listen to him." ALVAREZ was a member of FRY'S Hawkeye staff from 1979-86, then served as linebackers coach and later became the defensive coordinator for Lou HOLTZ at Notre Dame. He also played linebacker for the iconic Bob DEVANEY at Nebraska from 1965-67. But his blunt, hands-on approach to the game was developed in the steel-mill town of Langeloth, Pa., where ALVAREZ'S family settled after his grandparents immigrated to the United States. "I'm very proud of my heritage," ALVAREZ said. "My family comes from Northern Spain. I still have uncles, aunts and cousins back there." "The enthusiasm was just gone,"RARIDON said. 'They were getting 30 kids out for football and hadn't won a game in so long. The program was just a disaster." The 6-foot-3 RARIDON figured his athletic future would be in basketball. Instead, with ALVAREZ providing a nudge, he would go on to earn all-America honors as an offensive tackle for Nebraska. 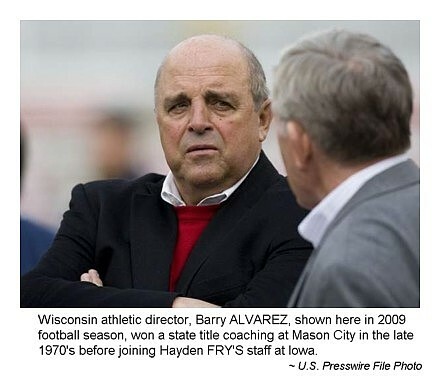 "If Barry Alvarez doesn’t go to Mason City," RARIDON says, "my whole entire life is different. No doubt about it." ALVAREZ secured the money for state-of-the-art workout equipment, then began forming a bond with his players. Together, they made old Roosevelt Stadium, located on Pennsylvania Avenue, a Friday night hot spot. "There are some who lead and coach by fear," RARIDON said. "And there are some who lead and coach by loyalty. Barry ALVAREZ is a loyalty guy. As a player, you just absolutely did not want to let him down." The Mohawks lost just once — a triple-overtime defeat to Fort Dodge — en route to the 1978 Class 4-A state championship. When they beat the Dodgers in a playoff semifinal, a pep rally was held at a disco hall known as "The Runway." "I thought it was a great town," said ALVAREZ, who is now the Wisconsin athletic director. "I thought it was a very active town, people who got involved. It was a fun time." "My theory was, to do a good job of recruiting Iowa, I needed to have a couple successful high school coaches from the state," said FRY, who took over the Hawkeye program in '79. "When I had him come in for an interview, he was extremely impressive, fundamentally very sound in coaching communication." "Barry relates very well with people," FERENTZ said. "And the players responded to him in a very, very strong way." "They both had different philosophies, yet they were both sound," ALVAREZ said when asked to compare FRY and HOLTZ. "There is different ways to get the job done, which told me to build my own." He was given that opportunity at Wisconsin, which went 6-27 from 1987-89. The Badgers were 1-10 in 1990, ALVAREZ'S first year. "I remember being over at Northwestern, and getting pummeled pretty good," former Iowa and Wisconsin assistant Bernie WYATT said. He also remembers telling ALVAREZ, "Jeez, we’ve got a long way to go, Barry." ALVAREZ responded: "We'll get there." "That's the way his demeanor was," WYATT said. "You can't go in with any negatives." Again, ALVAREZ sparked donors and upgraded the weight-lifting facilities. The payoff was a share of the Big Ten crown in 1993, and a 21-16 triumph over UCLA in the Rose Bowl. "It's just phenomenal," FERENTZ said. "They had really fallen off . . . Things just kind of dropped off the table there for a little while. It was really amazing to see how they built the program back up, and the level of success that they experienced." He also boasts a growing list of ex-assistants with notable careers, such as Bill CALLAHAN, who led the Oakland Raiders to a Super Bowl, Brad CHILDRESS, the current coach  of the Minnesota Vikings, and Bret BIELEMA, who succeeded ALVAREZ at Wisconsin. "It's just an aura about him, or something," said RARIDON, whose son, Scott Jr., played at Mason City and later Notre Dame. "You can tell he cares, and it reflects. I guarantee you he could call players from the 1970s, '90s, 2000s, and if he needed it, they would all rally behind him. No doubt about it." FAMILY: Wife, Cindy, daughters Dawn and Stacy, son Chad; six grandchildren. CAREER HIGHLIGHTS: Three Big Ten and Rose Bowl championship teams, with the only other conference coach to accomplish that being Ohio State's Woody HAYES. Coached or played in 22 bowl games (at Wisconsin, Notre Dame, Iowa and Nebraska). Was named one of the "100 Most Influential Hispanics" by Hispanic Business, in October of 2001. STRATEGY: Former assistant coach Bernie WYATT remembers how ALVAREZ preferred to keep things simple during key periods of a game. "You get all that done during the week, just getting work (done) on the game plan," WYATT said. "Then, if there’s a critical call, he'll say something like, 'Run Ron DAYNE.'" DAYNE won the Heisman Trophy in 1999.